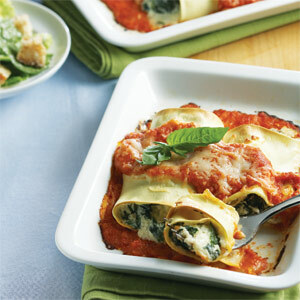 Warm up any night with this delightful manicotti dish. A quick tomato sauce, simple spinach filling, and plain pasta sheets make it a breeze to prepare. Use Barilla lasagna sheets—their oven-ready sheets (that cook as they bake) are about 3 x 7". Since the manicotti is rolled, parboiling is essential. Bring a large saucepan of salted water to a boil for the lasagna sheets. Preheat oven to 425°. Coat two small casserole dishes with nonstick spray. Blanch lasagna sheets in boiling water for 2 minutes. Arrange them in a single layer on a sheet of lightly greased foil. Sauté onion in ¼ cup oil in a saucepan over medium heat until soft, 2–3 minutes. Add garlic, sauté 1 minute, then stir in tomatoes, salt, and red pepper flakes. Simmer until tomatoes break down, 15–20 minutes. Purée sauce, stir in basil, and set aside. Wilt spinach in 1 tsp. oil in a large skillet over medium heat. Transfer to a bowl and stir in cheeses, egg white, and nutmeg, and season with salt and pepper. To assemble, spread 2 Tbsp. tomato sauce in each dish. Divide cheese filling among pasta sheets, roll, then place rolls in baking dishes. Top manicotti with sauce and Parmesan. Bake until rolls are heated through, about 25 minutes. Serve manicotti with remaining sauce. A hand blender makes puréeing the sauce easy, but a food processor or stand blender works, too. Blot the lasagna sheets dry with a paper towel, then fill with &frac13; cup of filling. Roll each filled sheet into a cylinder.